Independent workplace caterer, Olive Catering Services has been awarded a new contract by The FA's national football centre, St George’s Park. The new agreement will see Olive manage the staff restaurant at the flagship sports education and coaching facility in Staffordshire, which is home to England’s 28 national football teams. The deal, worth in excess of £1m over the three-year contract, will see Olive cater for approximately 220 members of staff from the head office and technical teams, as well as managing pitch-side catering for events such as the under-17 UEFA European championship, which took place earlier this year. ‘The Dugout’ restaurant will boast deli bars, specialist coffee counters, and a hospitality and match side catering provision. 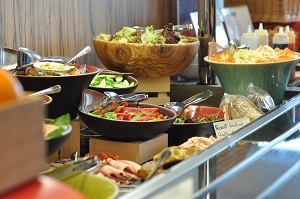 Olive will be serving its popular ‘Healthier Life’ menu (a range of balanced and nutritious meals) making it ideally suited for the needs of the staff working at St George’s Park. Damon Brown, Olive’s Co-Founder commented: “Securing the contract at St George’s Park is a brilliant achievement and we are excited to be opening a restaurant at such a prestigious site. Preparing fresh food that is nutritious and exciting is at the heart of everything we do, so we couldn’t wish for a better way to showcase this ethos than at St George’s Park”.